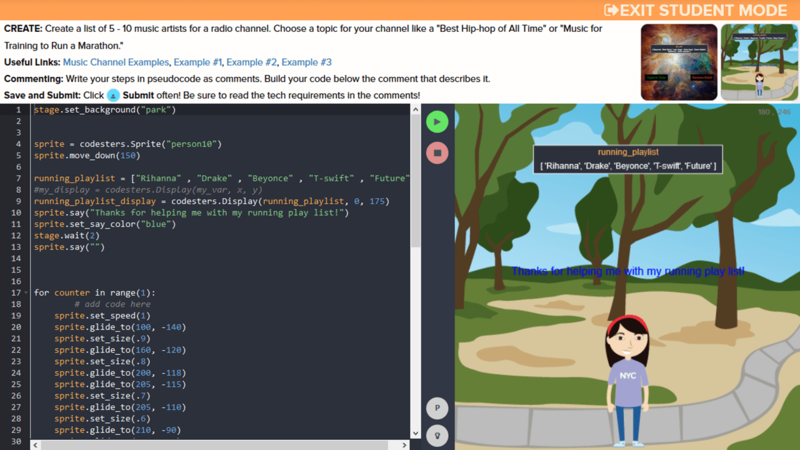 In this lesson, students will be introduced to text-based coding and basic coding sequencing. Students will learn to sequence instructions to help a student move from one location to another. Then students will apply those skills in an interactive game, writing CoffeeScript to give directions to a monkey to retrieve bananas. This lesson introduces students to the fascinating world of computers and to the EasyCode platform. In EasyCode Foundations, students learn key elements of text-based coding through an interactive game. 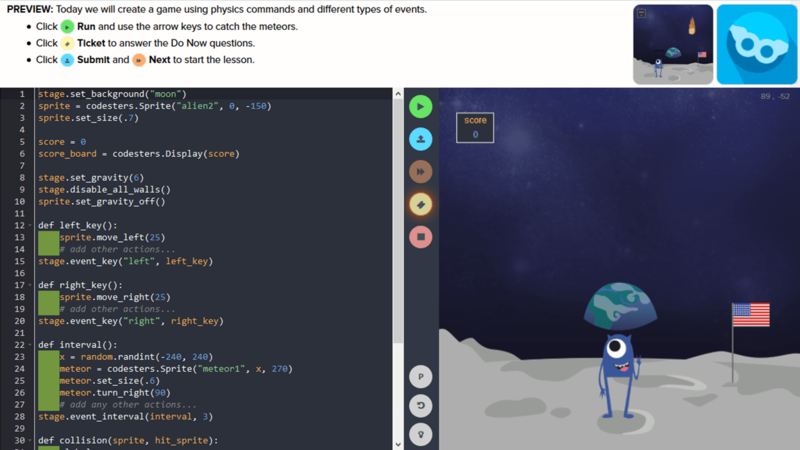 In this lesson, students will continue to explore the EasyCode platform by completing five more challenges. Prior to class, use the teacher dashboard to make sure all of your students have completed the first five challenges with three stars. In EasyCode Foundations, students learn key elements of text-based coding through an interactive game. This lesson revolves around planning. Everything we do in the physical world has to be planned, even if we sometimes do things automatically. We can cross the road without checking if it's clear, but that may result in a very dangerous outcome. Computers are the same. If we want to create a game or a program, we have to plan ahead and organize our instructions in the correct order. 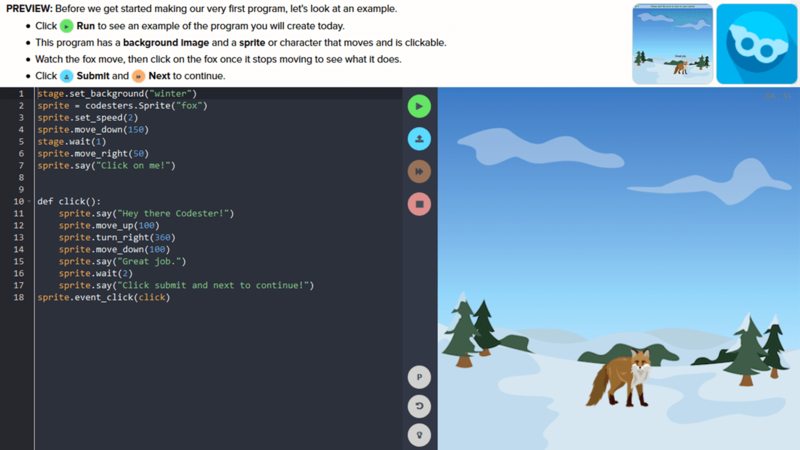 In EasyCode Foundations, students learn key elements of text-based coding through an interactive game. 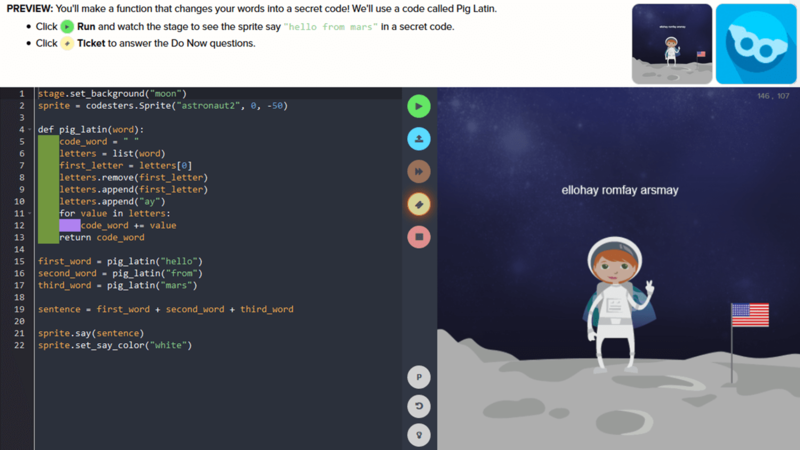 In this lesson, students will practice writing code that will carry out instructions in a specific order. They will also be introduced to calling methods on objects using dot notation in object-oriented programming. In EasyCode Foundations, students learn key elements of text-based coding through an interactive game. 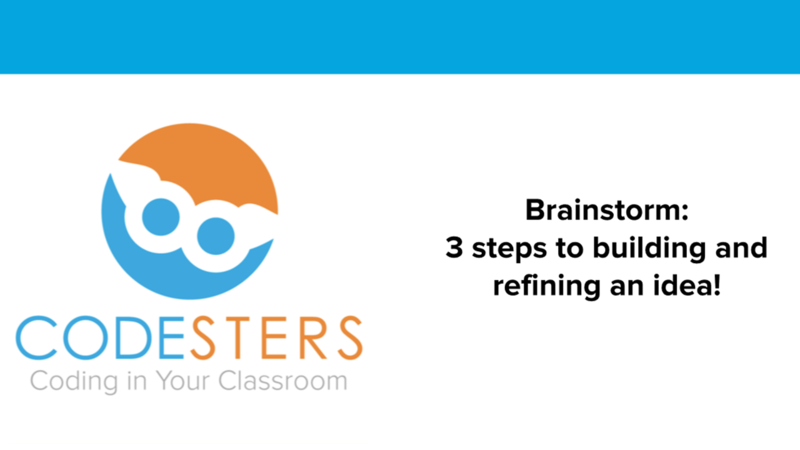 This lesson will focus on creating simple loops to accomplish a task through a repeating series of steps. In EasyCode Foundations, students learn key elements of text-based coding through an interactive game. This lesson continues practice with simple loops and will deepen student understanding of why it is important to use loops. 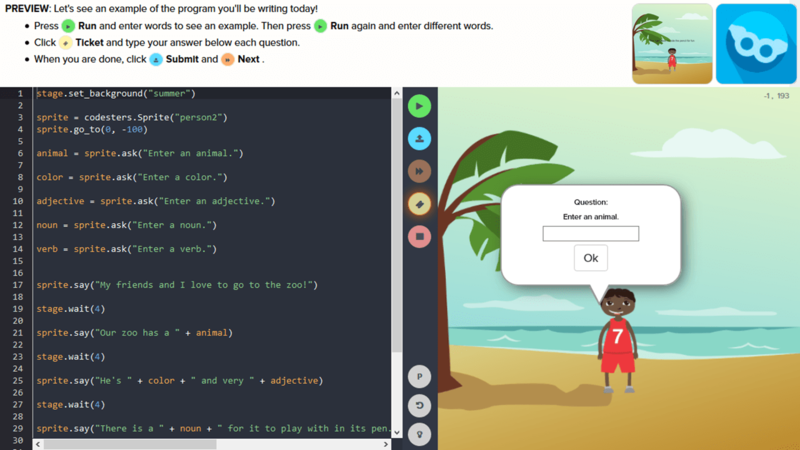 In EasyCode Foundations, students learn key elements of text-based coding through an interactive game. 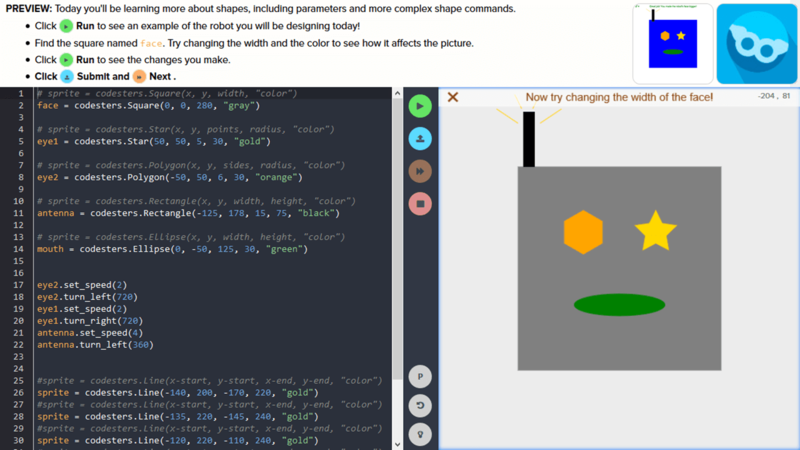 In this lesson, students will be introduced to variables and how they can be used to solve coding challenges and create solutions that work under changing conditions. In EasyCode Foundations, students learn key elements of text-based coding through an interactive game. In this lesson, students will continue using variables and will be introduced to a new function, distanceTo, that calculates the distance to another object. Students will use this function along with variables they create to solve coding challenges. In EasyCode Foundations, students learn key elements of text-based coding through an interactive game. 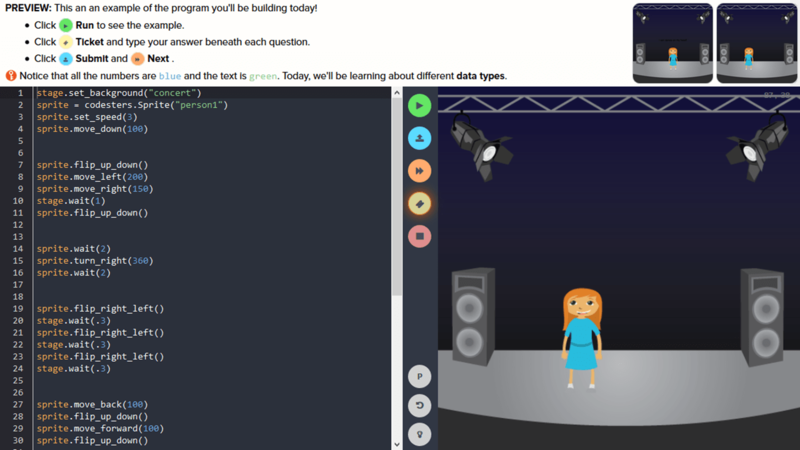 In this lesson, students will apply what they have learned about variables, functions, and function return values as they gain additional experience in using them to solve coding challenges. 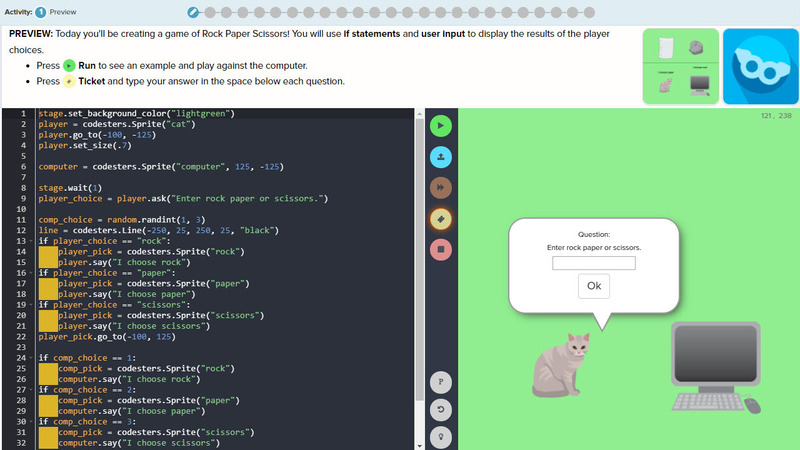 In EasyCode Foundations, students learn key elements of text-based coding through an interactive game. In this lesson, students will continue to gain experience using variables. The variables in these coding challenges will change throughout the course of the game in a given challenge. 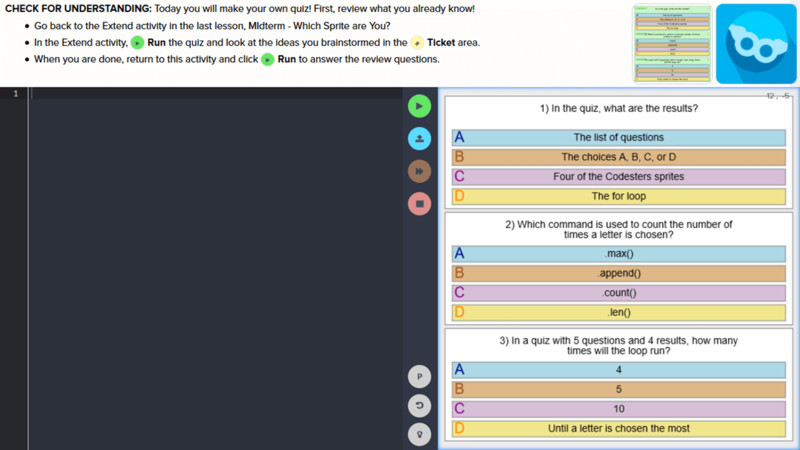 In EasyCode Foundations, students learn key elements of text-based coding through an interactive game. In this lesson, students are introduced to arrays and how to access elements in an array. They will access elements of arrays to solve coding challenges. In EasyCode Foundations, students learn key elements of text-based coding through an interactive game. 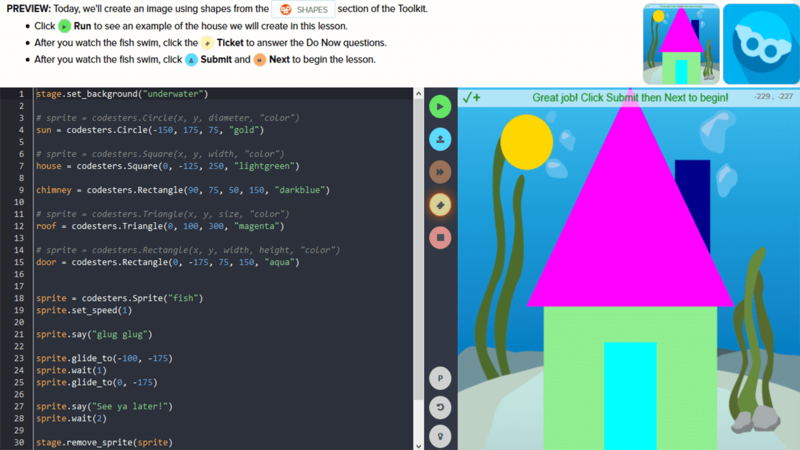 In this lesson, students are introduced to "for" loops and learn how to use them to iterate over a collection of objects to solve coding challenges. In EasyCode Foundations, students learn key elements of text-based coding through an interactive game. In this lesson, students will continue to practice using arrays and "for" loops to iterate over collections of objects. Iterating over collections of objects is such a fundamental concept in computer science and is used so frequently in writing code, that it is worthwhile to spend some additional time to practice. In EasyCode Foundations, students learn key elements of text-based coding through an interactive game. In this lesson, students will continue to explore and practice using "for" loops to iterate through collections of objects. In EasyCode Foundations, students learn key elements of text-based coding through an interactive game. 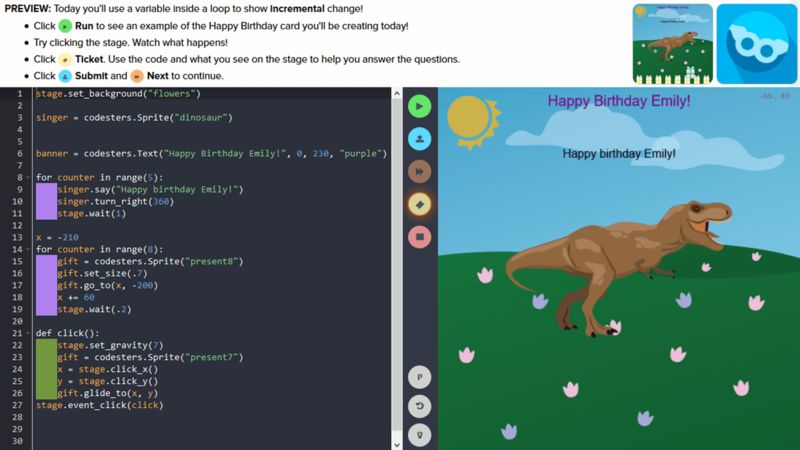 This lesson introduces students to EasyCode’s Challenge Builder. Using the builder, students will be able to create their own challenges, share the created challenges and solve each other’s challenges. 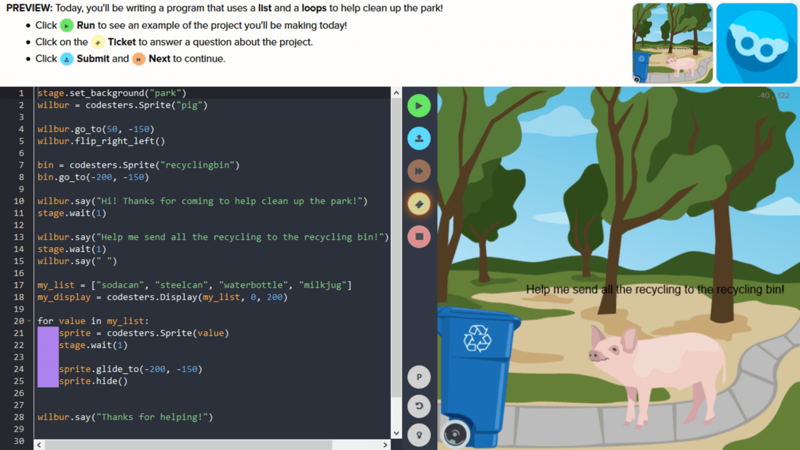 This lesson provides students with a way to apply their coding knowledge to create work products of their own. 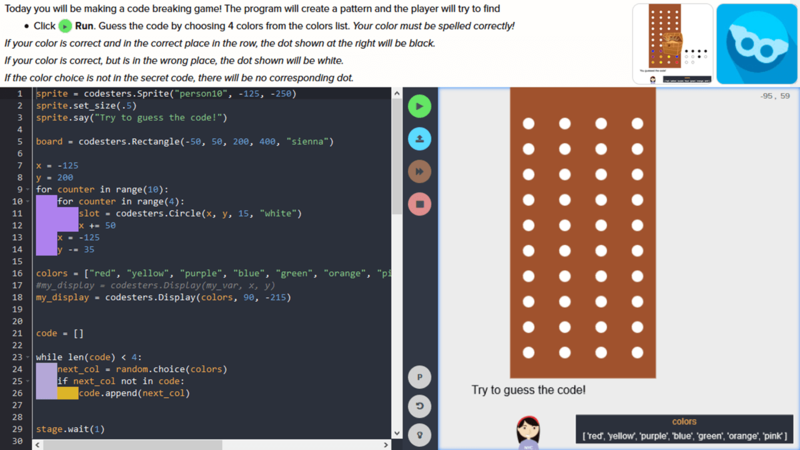 In EasyCode Foundations, students learn key elements of text-based coding through an interactive game. In this lesson, students gain practice refactoring code. Students will revisit challenges they have completed previously and identify ways to improve their code. In EasyCode Foundations, students learn key elements of text-based coding through an interactive game. In this lesson, students will continue practicing calling and creating functions. They will also gain practice in debugging functions. 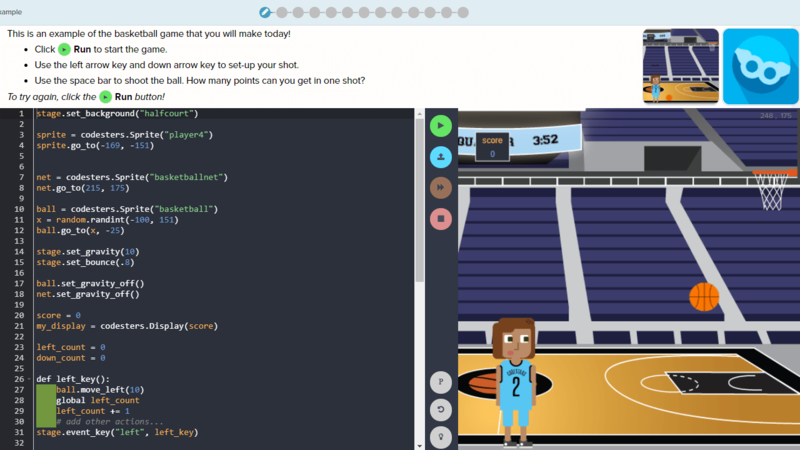 In EasyCode Foundations, students learn key elements of text-based coding through an interactive game. In this lesson, students will continue to practice writing function definitions. They will also experiment with defining functions that call each other. 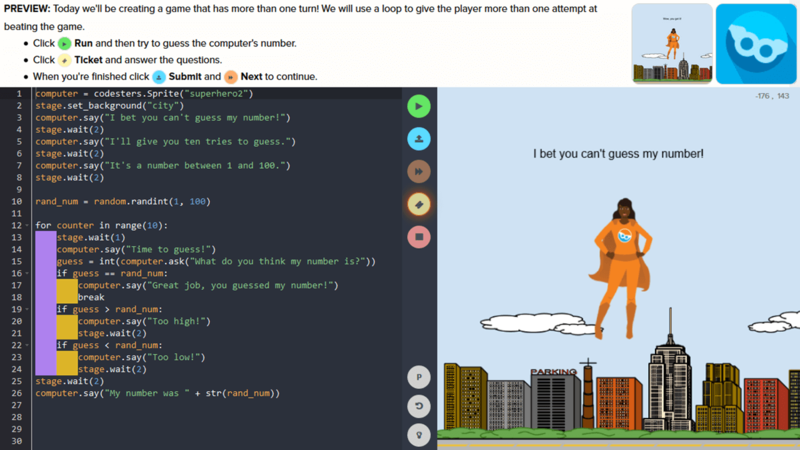 In EasyCode Foundations, students learn key elements of text-based coding through an interactive game. In this lesson, students will learn about until loops and use them to perform tasks until a condition is met. In EasyCode Foundations, students learn key elements of text-based coding through an interactive game. In this lesson, students will continue to practice the use of until loops, including writing loops with more than one statement inside them and using an until loop inside a function definition. In EasyCode Foundations, students learn key elements of text-based coding through an interactive game. This lesson is a review lesson. Students will review all concepts they have learned in the previous lessons. In EasyCode Foundations, students learn key elements of text-based coding through an interactive game. In this lesson, students will be introduced to conditionals using if statements. In EasyCode Foundations, students learn key elements of text-based coding through an interactive game. In this lesson, students will continue to practice using if statements and learn to use if-else conditionals. In EasyCode Foundations, students learn key elements of text-based coding through an interactive game. 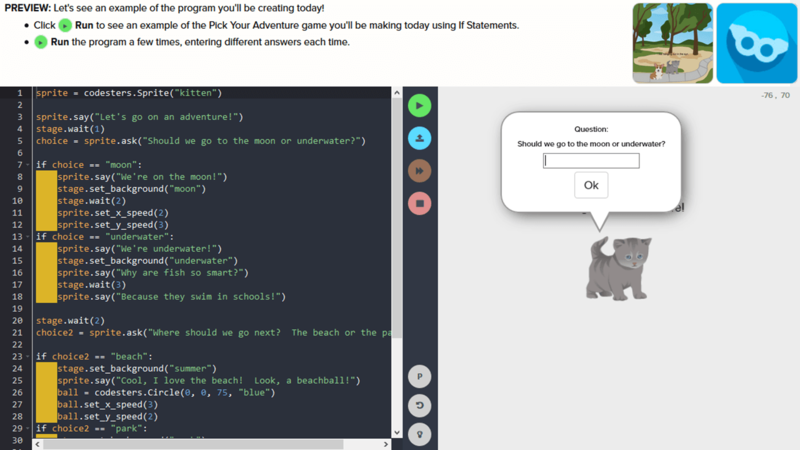 In this lesson, students will practice using if and if-else conditionals to solve coding challenges. 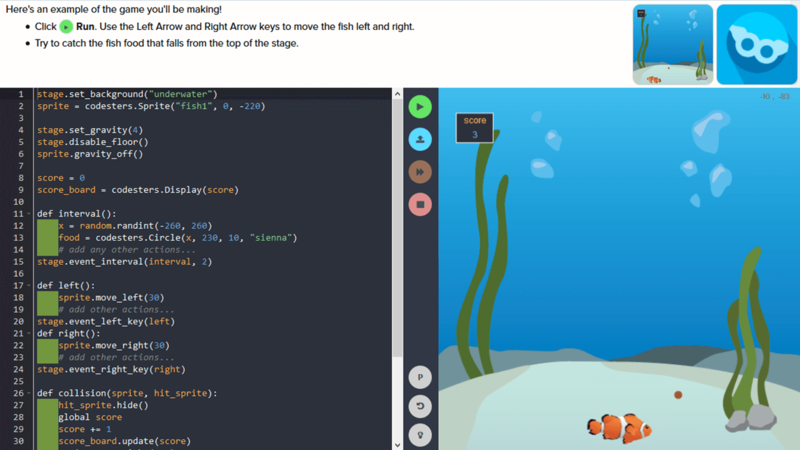 In EasyCode Foundations, students learn key elements of text-based coding through an interactive game. This lesson introduces the logical "and" operator and uses it in certain conditional statements. 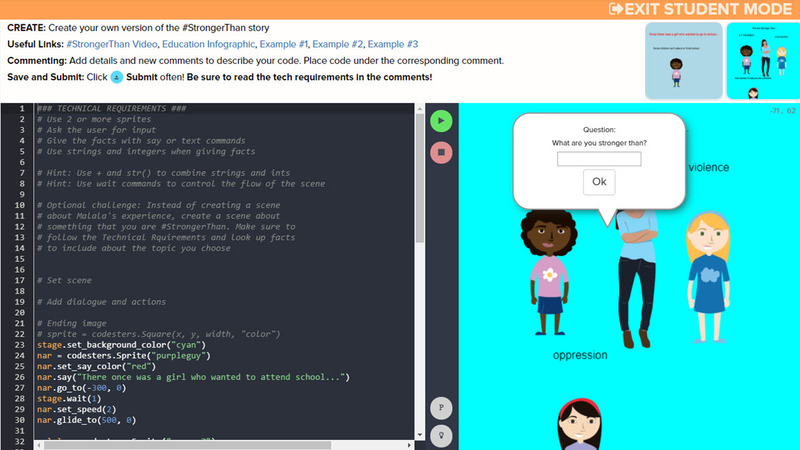 In EasyCode Foundations, students learn key elements of text-based coding through an interactive game. This lesson introduces the logical "or" operator and uses it in conditional statements. Students will also practice using the "and" operator and learn to distinguish the difference between these two operators. In EasyCode Foundations, students learn key elements of text-based coding through an interactive game. In this lesson, students will continue to practice conditionals and logic. This lesson also introduces the concept of polymorphism at an introductory level. In EasyCode Foundations, students learn key elements of text-based coding through an interactive game. In this lesson, students will continue practicing logic operators. They will practice "and" and "or" operators. And students will meet a new character - the penguins. Students will use "and" and "or" to move the penguins to form a bridge for the monkey. In EasyCode Foundations, students learn key elements of text-based coding through an interactive game. 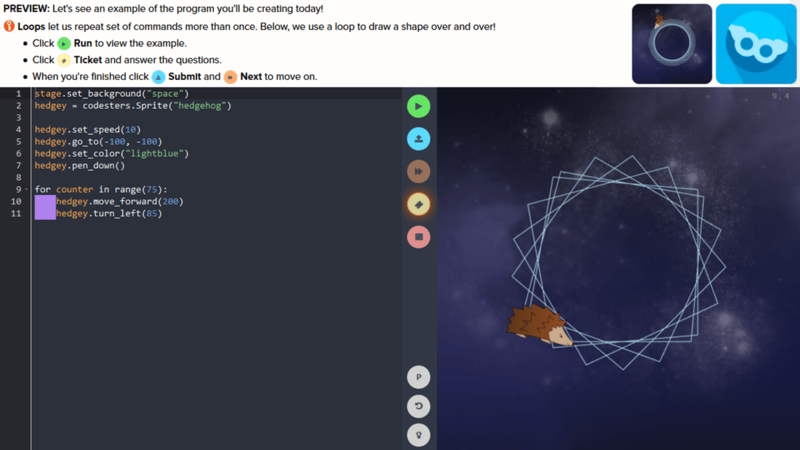 In this lesson, students will create their own coding challenges to demonstrate the different loops that can be completed by other students. This lesson can be modified to any topic learned in EasyCode by changing the instructions and the first Discussion to fit the new topic. 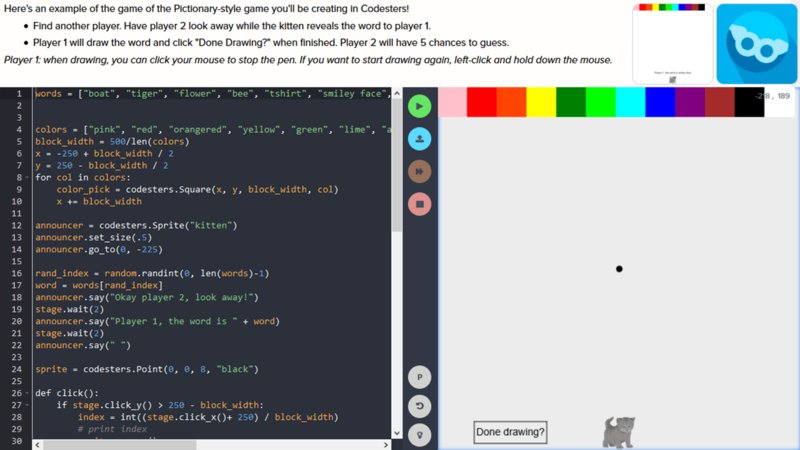 In EasyCode Foundations, students learn key elements of text-based coding through an interactive game. In this workshop, students will create challenges to demonstrate the different conditionals. This workshop can be modified to any topic learned in EasyCode, just change the instructions and the first discussion to fit the new topic. 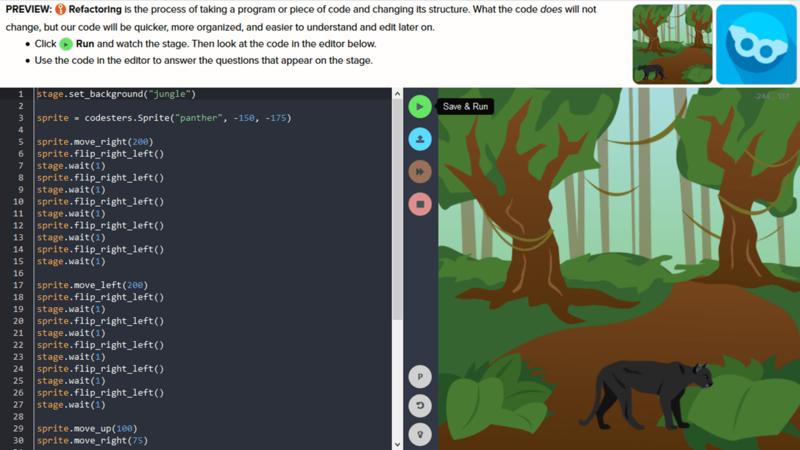 In EasyCode Foundations, students learn key elements of text-based coding through an interactive game. In this lesson, students will create a maze in the Challenge Builder. While creating a maze is a relatively simple task, the challenge is to make the maze solvable. This adds a strong element of testing to the student experience. 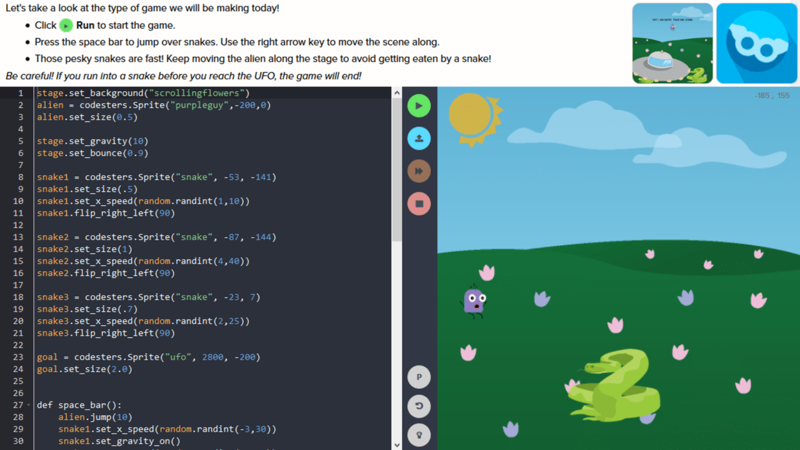 In EasyCode Foundations, students learn key elements of text-based coding through an interactive game. This lesson introduces the "not" operator and its use with conditionals. Students will also continue practice with conditionals learned in previous lessons. 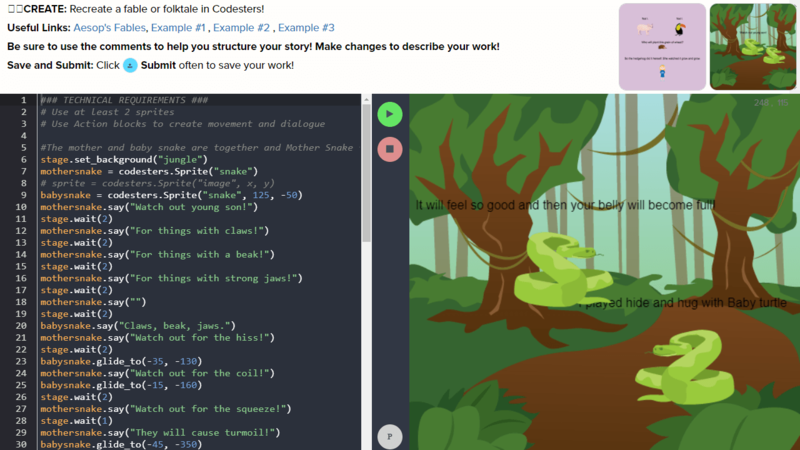 In EasyCode Foundations, students learn key elements of text-based coding through an interactive game. This lesson introduces the equality operator (==) in CoffeeScript. In it, students gain practice using this operator to compare 2 values. In EasyCode Foundations, students learn key elements of text-based coding through an interactive game. This lesson introduces the less-than inequality operator (<). In this lesson, students will practice using the less-than operator to compare 2 values. In EasyCode Foundations, students learn key elements of text-based coding through an interactive game. In this lesson, students will build on their understanding of writing functions and add the ability of writing functions that return a value. In EasyCode Foundations, students learn key elements of text-based coding through an interactive game. In this lesson, students will gain experience working with parameters in a function and in sending arguments to functions. They also learn a new method for calling a function with arguments. In EasyCode Foundations, students learn key elements of text-based coding through an interactive game. In this lesson, students will practice what they have learned about writing functions with return values, using the not operator in conditionals, and using the relational operators <, >, and == to compare 2 values. In EasyCode Foundations, students learn key elements of text-based coding through an interactive game. In this lesson, students will learn what keyboard events are and how to listen for keyboard events in code and react to a specific event. In EasyCode Foundations, students learn key elements of text-based coding through an interactive game. In this lesson, students will continue gaining experience with working with keyboard events and also explore the difference between regular, sequenced code, and event driven sequences. In EasyCode Foundations, students learn key elements of text-based coding through an interactive game. In this lesson, students will continue to practice working with keyboard events and combine keyboard events with other conditionals events. In EasyCode Foundations, students learn key elements of text-based coding through an interactive game. 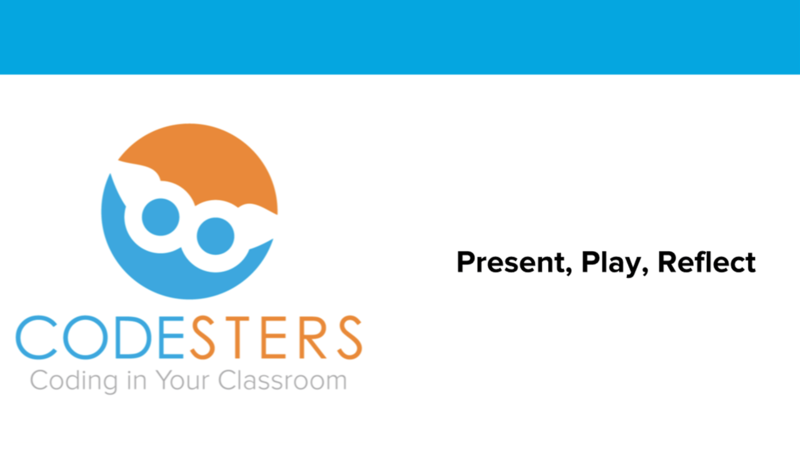 In this lesson, students will add mouse click events to toolkit of event handlers. In EasyCode Foundations, students learn key elements of text-based coding through an interactive game. In this lesson, students will use click events to select objects that will then be moved with keyboard events. Students will gain further practice with variables, this time using an object of a click event as a variable. In EasyCode Foundations, students learn key elements of text-based coding through an interactive game. In this culminating lesson for the story challenges, students will use all the skills they have learned to create the full controls needed to help control the final "boss-level" challenge. In it, students will practice mouse move and click events and keyboard events. They will gain considerable experience in testing their solutions and identifying better ways to solve problems. In EasyCode Foundations, students learn key elements of text-based coding through an interactive game. In this lesson, students will use the Challenge Builder to create challenges for other students to try that demonstrate their understanding of the different events learned in previous challenges. In EasyCode Foundations, students learn key elements of text-based coding through an interactive game. 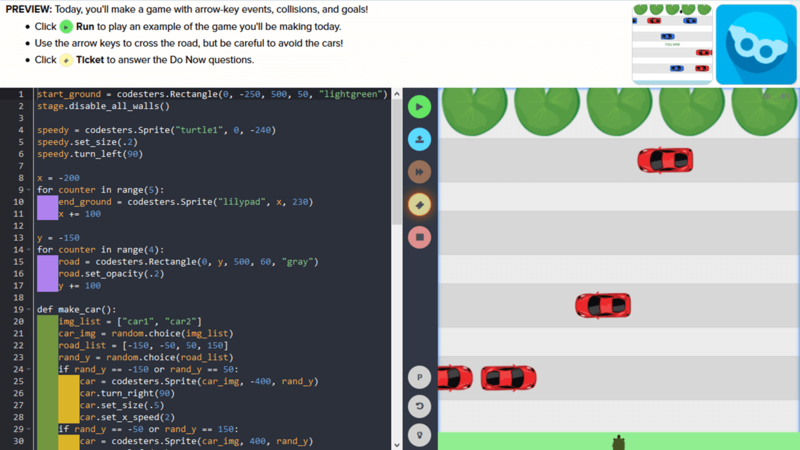 In this lesson, students will use the Challenge Builder to create their own challenges to share with other students to demonstrate their understanding of the differences between event-driven code and sequential code. In EasyCode Foundations, students learn key elements of text-based coding through an interactive game. In this lesson, students will revisit the challenges they have already solved that may not have received 3-stars and work to find better solutions to each code challenge. In EasyCode Foundations, students learn key elements of text-based coding through an interactive game. This resource is a scope and sequence for EasyCode Foundations curriculum. 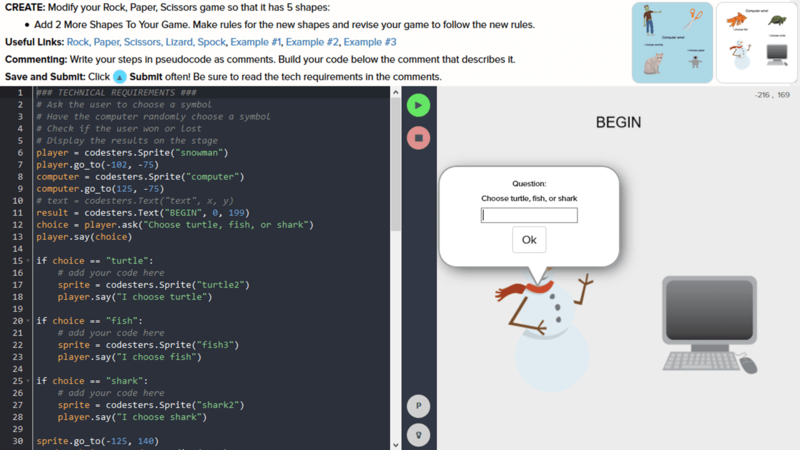 In EasyCode Foundations, students learn key elements of text-based coding through an interactive game. This resource is a quick reference to all the components in EasyCode Foundations with descriptions as to how and why they are used. In EasyCode Foundations, students learn key elements of text-based coding through an interactive game. This resource outlines each character in EasyCode Foundations and how the characters are used throughout the challenges. In EasyCode Foundations, students learn key elements of text-based coding through an interactive game. This resource is a guide that can be used by students to help learn how to create challenges in the Challenge Builder. In EasyCode Pillars, students learn key elements of coding in Python through interactive coding challenges and by building interactive projects and games. 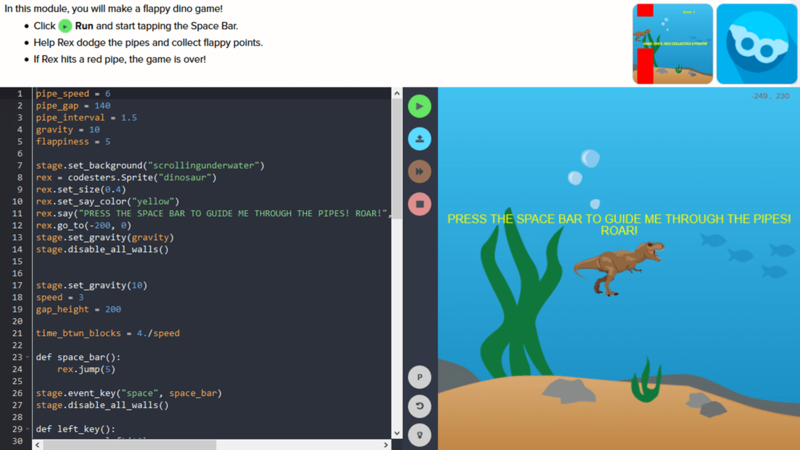 In this introductory lesson, students will learn to use EasyCode Pillars environment to create their first program by creating a scene with a background, sprite, text, movement, and interactivity. 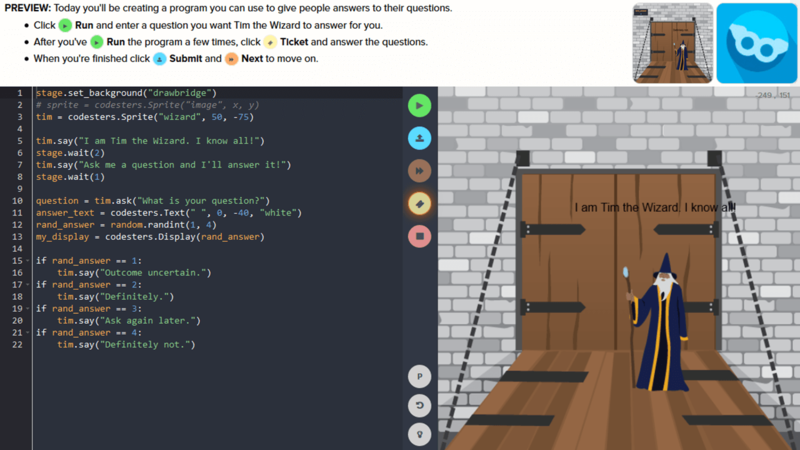 In EasyCode Pillars, students learn key elements of coding in Python through interactive coding challenges and by building interactive projects and games. In this lesson, students will learn to use the (X,Y) Coordinate Plane to move a sprite around a stage that uses the background as context for creating a short animated scene. 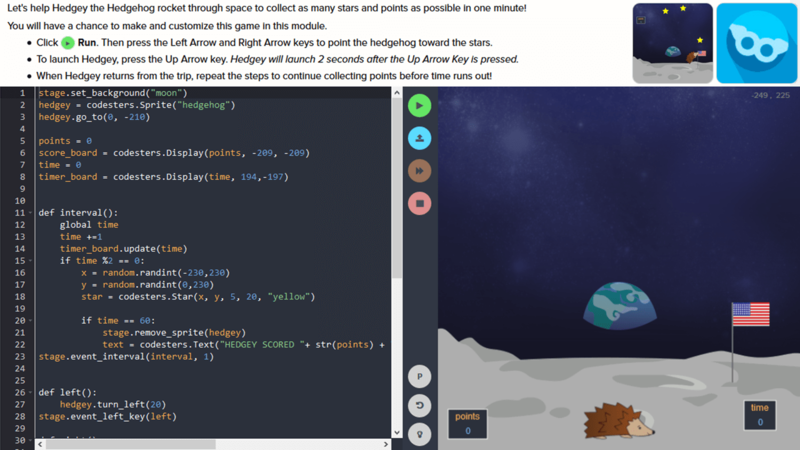 In EasyCode Pillars, students learn key elements of coding in Python through interactive coding challenges and by building interactive projects and games. In this lesson, students will learn to change the variable names and parameters of shape objects to create a picture of a house. In EasyCode Pillars, students learn key elements of coding in Python through interactive coding challenges and by building interactive projects and games. In this lesson, students will use loops, lists and variables to understand looping behavior. In EasyCode Pillars, students learn key elements of coding in Python through interactive coding challenges and by building interactive projects and games. In this initial lesson, students will gain experience with order functions in programming and learn to troubleshoot when the instructions within a program are out of order. In EasyCode Pillars, students learn key elements of coding in Python through interactive coding challenges and by building interactive projects and games. In this lesson, students will learn about parameters and how parameters are used to define shapes. 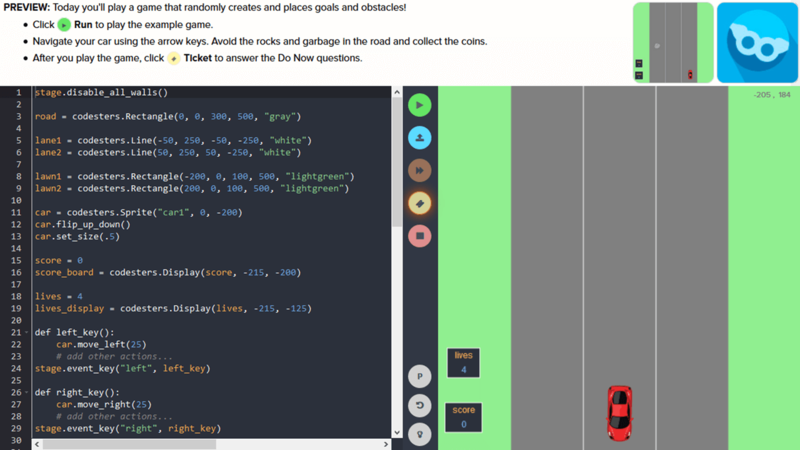 In EasyCode Pillars, students learn key elements of coding in Python through interactive coding challenges and by building interactive projects and games. 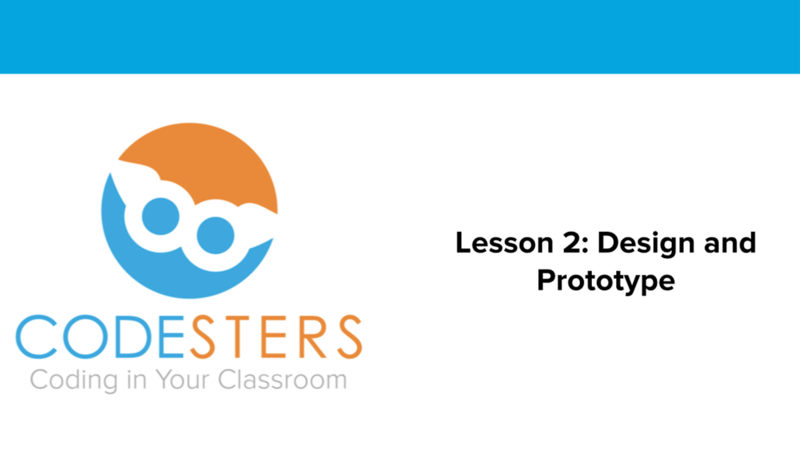 In this lesson, students will learn how to use dot notation to organize the actions of multiple sprites. 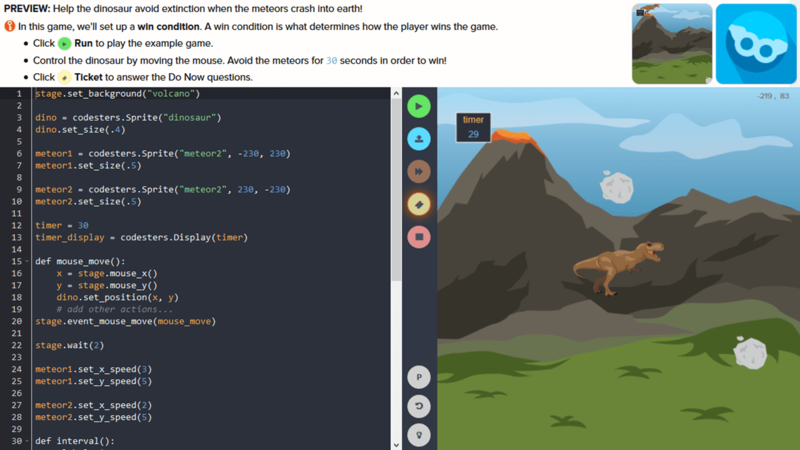 In EasyCode Pillars, students learn key elements of coding in Python through interactive coding challenges and by building interactive projects and games. In this lesson, students will learn how to create and use variables. They will also use a random number generator to generate random numbers. In EasyCode Pillars, students learn key elements of coding in Python through interactive coding challenges and by building interactive projects and games. In this lesson, students will create and use variables to make a program more efficient. In EasyCode Pillars, students learn key elements of coding in Python through interactive coding challenges and by building interactive projects and games. In this lesson, students will combine two values of the same data type to communicate a story. In EasyCode Pillars, students learn key elements of coding in Python through interactive coding challenges and by building interactive projects and games. In this lesson, students will create a calculator to determine the area of a shape. Students will learn to use basic math operators to add, subtract, multiply, and divide. Students will also use str() to combine a string with an integer variable. In EasyCode Pillars, students learn key elements of coding in Python through interactive coding challenges and by building interactive projects and games. 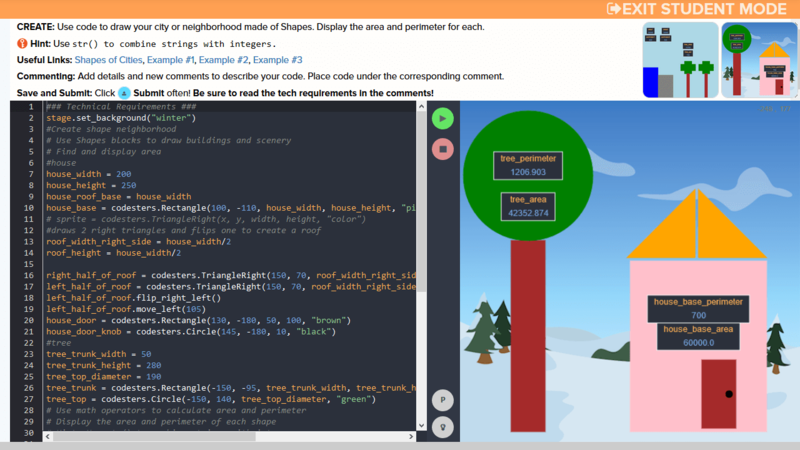 In this review lesson, students will demonstrate mastery of early programming concepts. These include using variables and dot notation to accomplish a specific task or goal, using variables to store and display values, distinguishing between strings and integers, and using math symbols to compute the results of mathematical operations. In EasyCode Pillars, students learn key elements of coding in Python through interactive coding challenges and by building interactive projects and games. In this lesson, students will use a for loop to repeat commands. In EasyCode Pillars, students learn key elements of coding in Python through interactive coding challenges and by building interactive projects and games. In this lesson, students will create and store temporary values as they change it through iterations in a loop. In EasyCode Pillars, students learn key elements of coding in Python through interactive coding challenges and by building interactive projects and games. 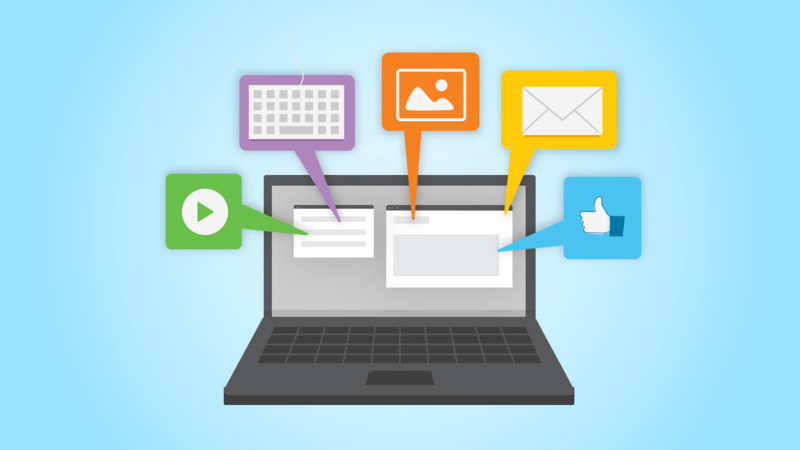 In this lesson, students will collect and store user input to be used in a story. In EasyCode Pillars, students learn key elements of coding in Python through interactive coding challenges and by building interactive projects and games. In this lesson, students will use if statements to generate a story based on user input. In EasyCode Pillars, students learn key elements of coding in Python through interactive coding challenges and by building interactive projects and games. 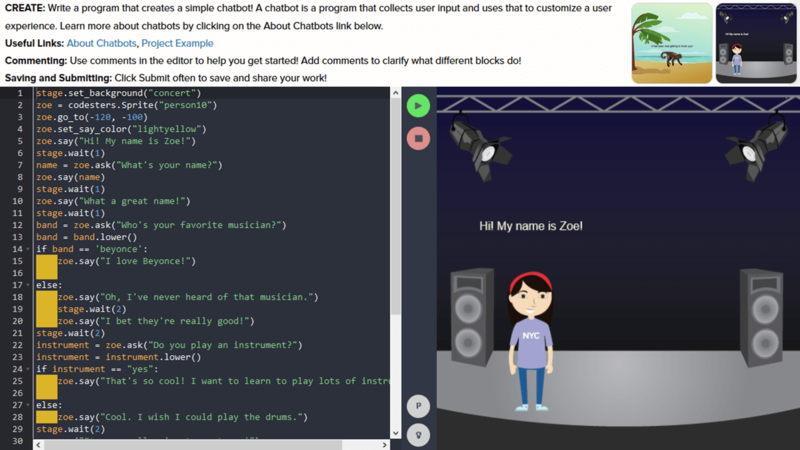 In this lesson, students will write a program that interacts with a user and generates random feedback. In it, they will randomize a response to user questions using if statements and random number generation. In EasyCode Pillars, students learn key elements of coding in Python through interactive coding challenges and by building interactive projects and games. In this lesson, students will create a program that accepts and displays user input, and shows a randomly generated computer response. Who Won Rock, Paper, Scissors? In EasyCode Pillars, students learn key elements of coding in Python through interactive coding challenges and by building interactive projects and games. In this lesson, students will create a rock-paper-scissors-type game that will compare user answers to randomly generated computer answers and determine a win, loss, or tie from these comparisons. In EasyCode Pillars, students learn key elements of coding in Python through interactive coding challenges and by building interactive projects and games. 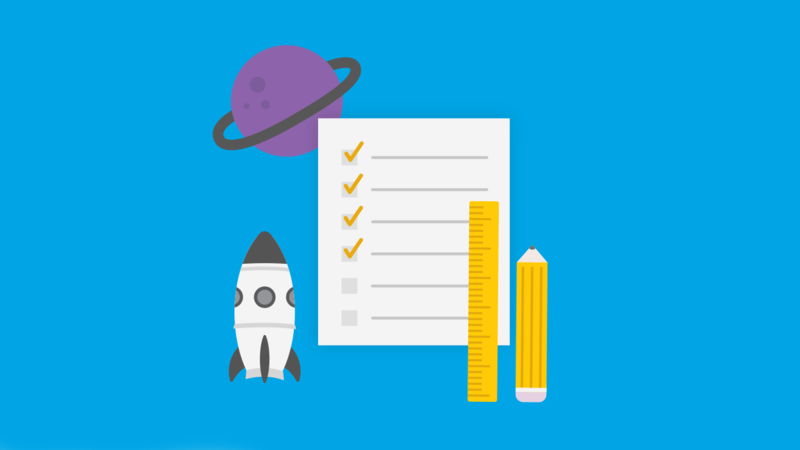 In this lesson, students will create and structure lists using list operations and getters. In EasyCode Pillars, students learn key elements of coding in Python through interactive coding challenges and by building interactive projects and games. In this lesson, students will create a guessing game by building a "for" loop with a counter and "in [range]". In EasyCode Pillars, students learn key elements of coding in Python through interactive coding challenges and by building interactive projects and games. In this lesson, students will create a guessing game by building a loop that accesses each value in list. In EasyCode Pillars, students learn key elements of coding in Python through interactive coding challenges and by building interactive projects and games. Students will learn to create a quiz program by synthesizing and applying the programming concepts mastered during Intro to Python, Part 1. In EasyCode Pillars, students learn key elements of coding in Python through interactive coding challenges and by building interactive projects and games. 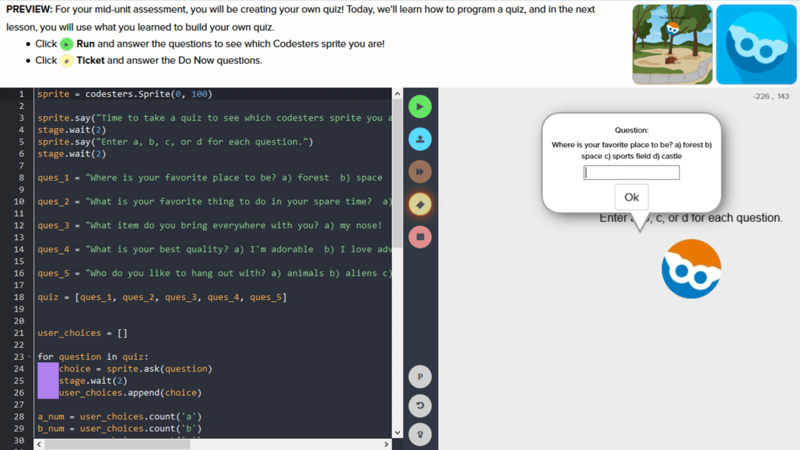 In this lesson, students will plan and build a unique quiz program synthesizing the programming concepts mastered during Intro to Python, Part 1. In EasyCode Pillars, students learn key elements of coding in Python through interactive coding challenges and by building interactive projects and games. 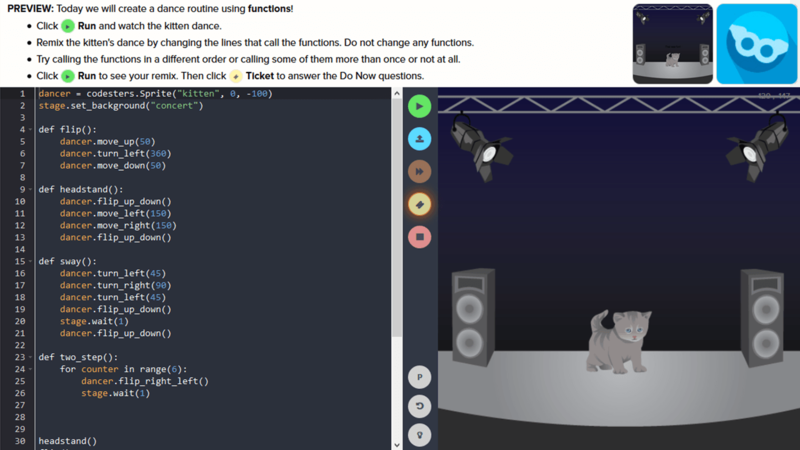 In this lesson, students will learn to write and call simple functions (without parameters). In EasyCode Pillars, students learn key elements of coding in Python through interactive coding challenges and by building interactive projects and games. In this lesson, students will write functions and call them, focusing on the order in which functions are called. In EasyCode Pillars, students learn key elements of coding in Python through interactive coding challenges and by building interactive projects and games. In this lesson, students will use indexes to reference lists and reorganize lists. In EasyCode Pillars, students learn key elements of coding in Python through interactive coding challenges and by building interactive projects and games. 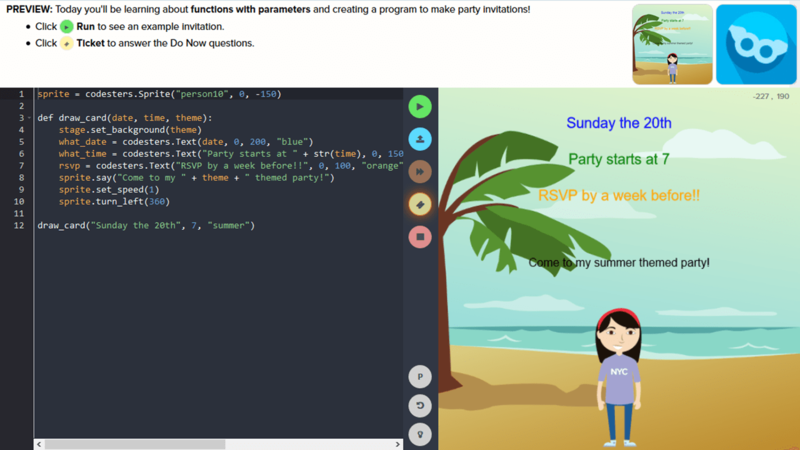 In this lesson, students will create functions with parameters and use them to create a format for a party invitation. In EasyCode Pillars, students learn key elements of coding in Python through interactive coding challenges and by building interactive projects and games. In this lesson, students will create an encoder that takes in messages and outputs a coded message. In EasyCode Pillars, students learn key elements of coding in Python through interactive coding challenges and by building interactive projects and games. 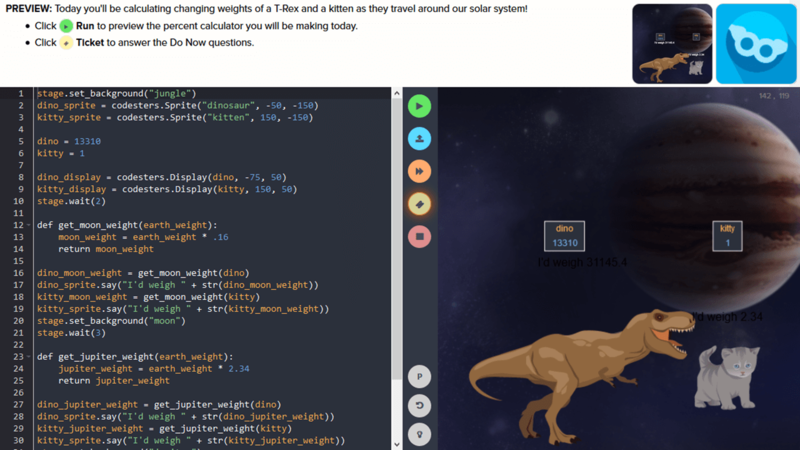 In this lesson, students will create a program to calculate the weight of objects as a percentage of their weight on earth using returns and functions with parameters. In EasyCode Pillars, students learn key elements of coding in Python through interactive coding challenges and by building interactive projects and games. 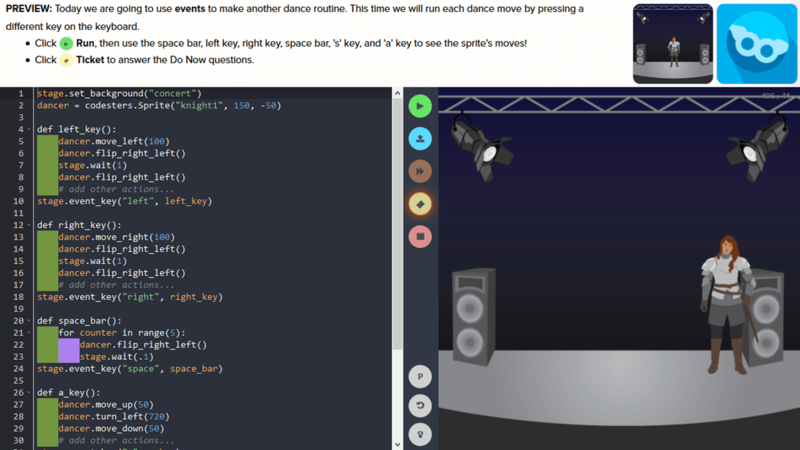 In this lesson, students will use events to create a player-controlled dance routine. In EasyCode Pillars, students learn key elements of coding in Python through interactive coding challenges and by building interactive projects and games. In this lesson, students will use collision events to define game play. They will use event handlers to call specific sprites and assign them different roles in collision. In EasyCode Pillars, students learn key elements of coding in Python through interactive coding challenges and by building interactive projects and games. In this lesson, students will learn about interval events and use them in building a game to trigger actions that happen after a certain amount of time. In EasyCode Pillars, students learn key elements of coding in Python through interactive coding challenges and by building interactive projects and games. In this lesson, students will use interval events, random choice, and click events to create a Whack-a-Mole style game. In EasyCode Pillars, students learn key elements of coding in Python through interactive coding challenges and by building interactive projects and games. In this lesson, students will create a game that uses mouse movement and interval events to control game play. They will use collisions and changing variable values to determine game length. Students will also set physics values to control movement of particular objects on the stage. In EasyCode Pillars, students learn key elements of coding in Python through interactive coding challenges and by building interactive projects and games. In this lesson, students will learn to write their own functions for use in events. In EasyCode Pillars, students learn key elements of coding in Python through interactive coding challenges and by building interactive projects and games. In this lesson, students will create a side-scroller game where the user controls the background movement to give the appearance of constant movement. In EasyCode Pillars, students learn key elements of coding in Python through interactive coding challenges and by building interactive projects and games. In this lesson, students will create a game that uses probability to generate hazards and goals. They will use interval events and falling objects to give the appearance of motion. In EasyCode Pillars, students learn key elements of coding in Python through interactive coding challenges and by building interactive projects and games. 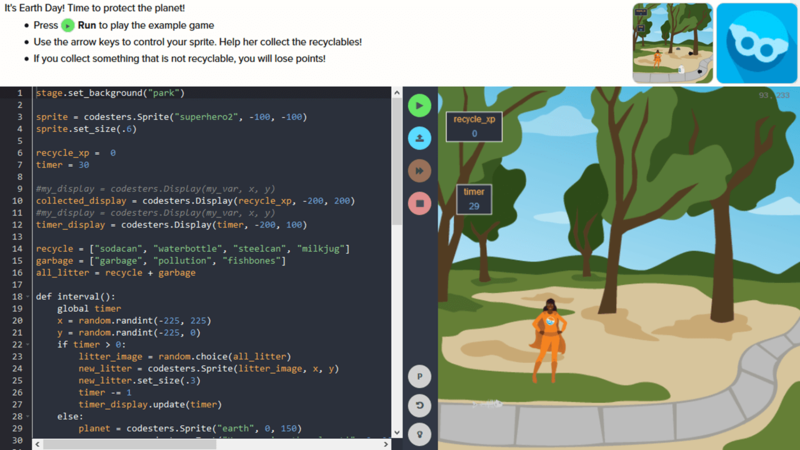 In this lesson, students will use event keys, collision events, a global timer and a scoreboard to create a game where a character collects goal objects. In EasyCode Pillars, students learn key elements of coding in Python through interactive coding challenges and by building interactive projects and games. In this lesson, students will use lists and random choice commands to create sprites with random images to use as goals and hazards in their game. In EasyCode Pillars, students learn key elements of coding in Python through interactive coding challenges and by building interactive projects and games. In this lesson, students will use the physics toolkit to create a falling-object type of game. In EasyCode Pillars, students learn key elements of coding in Python through interactive coding challenges and by building interactive projects and games. In this lesson, students will use the physics toolkit, interval-event, and random number generators to create a flappy-bird style, perpetual motion game. In EasyCode Pillars, students learn key elements of coding in Python through interactive coding challenges and by building interactive projects and games. In this lesson, students will create an extra-long stage background to create a side scrolling type of game. In EasyCode Pillars, students learn key elements of coding in Python through interactive coding challenges and by building interactive projects and games. In this lesson, students will recreate the classic Brick Breaker style game using physics, random speed settings, and a collision event. In EasyCode Pillars, students learn key elements of coding in Python through interactive coding challenges and by building interactive projects and games. In this lesson, students will create a pull-and-shoot style game using stage physics and event keys. In EasyCode Pillars, students learn key elements of coding in Python through interactive coding challenges and by building interactive projects and games. In this lesson, students will create a Pictionary style drawing game for two players. In EasyCode Pillars, students learn key elements of coding in Python through interactive coding challenges and by building interactive projects and games. 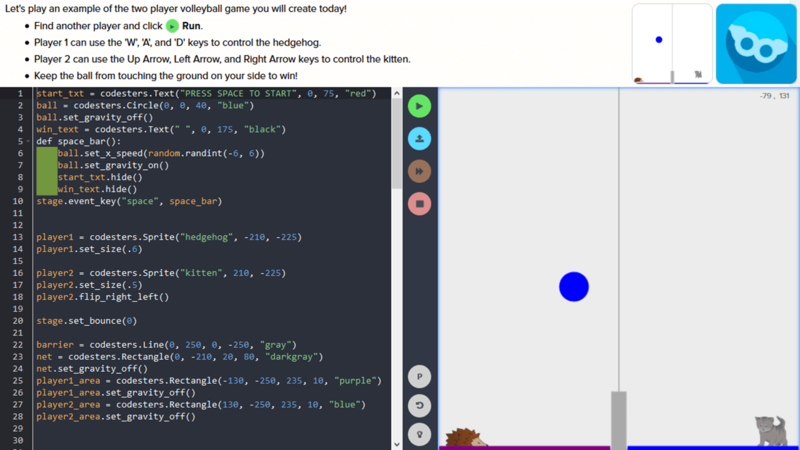 In this lesson, students will create a two player volleyball/pong style game that uses key events, stage physics, and boundaries as hazards. In EasyCode Pillars, students learn key elements of coding in Python through interactive coding challenges and by building interactive projects and games. In this lesson, students will create their own version of a Mastermind style board game. In EasyCode Pillars, students learn key elements of coding in Python through interactive coding challenges and by building interactive projects and games. This lesson is Day 1 of the Final Project for the course. In it, students will use artifacts to define a problem and collaborate to identify a potential solution. In EasyCode Pillars, students learn key elements of coding in Python through interactive coding challenges and by building interactive projects and games. This lesson is Day 2 of the Final Project for the course. In it, students will develop a paper prototype and test the prototype with user feedback. In EasyCode Pillars, students learn key elements of coding in Python through interactive coding challenges and by building interactive projects and games. This lesson is Day 3 of the Final Project for the course. 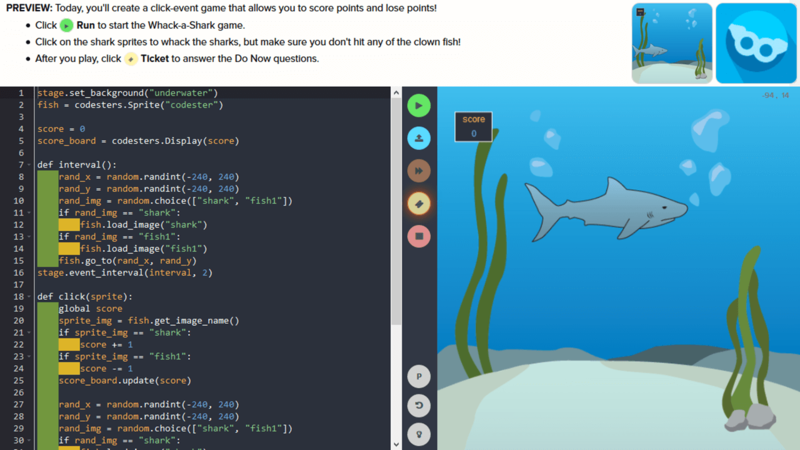 In it, students will use a tutorial to program a basic game. In EasyCode Pillars, students learn key elements of coding in Python through interactive coding challenges and by building interactive projects and games. This lesson is Day 4 of the Final Project for the course. 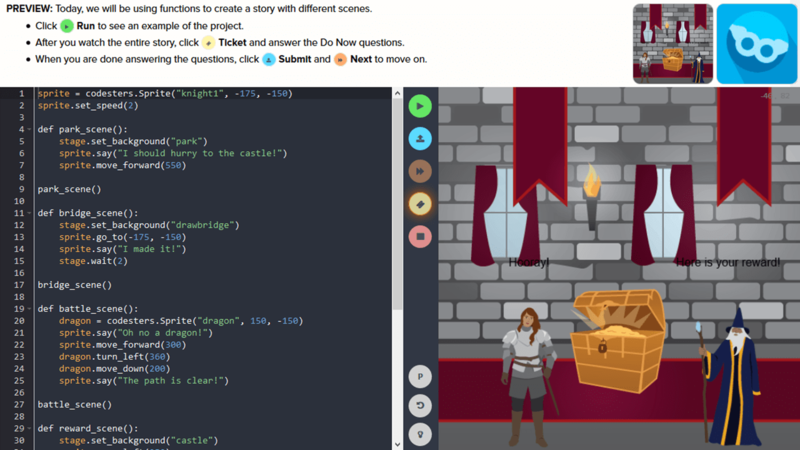 In it, students will use their knowledge of coding to complete a series of coding challenges and to start building their own game or interactive story. In EasyCode Pillars, students learn key elements of coding in Python through interactive coding challenges and by building interactive projects and games. This lesson is Day 5 of the Final Project for the course. In it, students will use their knowledge of coding to build a game or story that demonstrates learned concepts and present their work. In EasyCode Pillars, students learn key elements of coding in Python through interactive coding challenges and by building interactive projects and games. 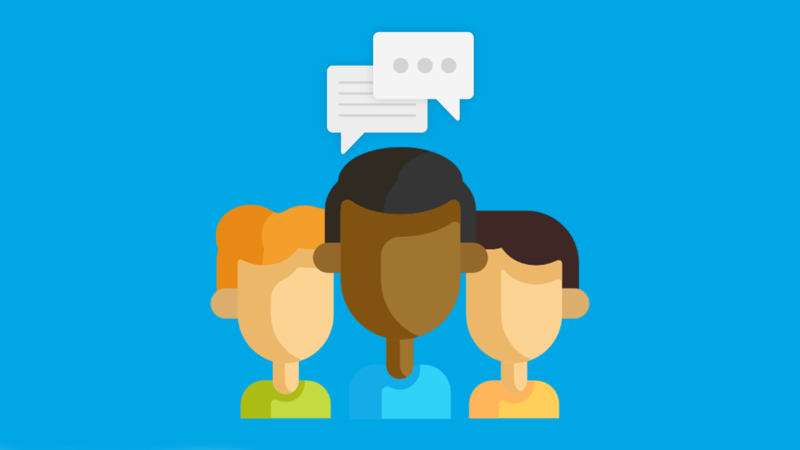 This resource provides helpful tips for working with your students on EasyCode Pillars for the first time. In EasyCode Pillars, students learn key elements of coding in Python through interactive coding challenges and by building interactive projects and games. This teacher resource can be used to create a word wall in the classroom to help student recall key vocabulary in EasyCode Pillars. It includes large font keywords and their definitions for each part of EasyCode Pillars. In EasyCode Pillars, students learn key elements of coding in Python through interactive coding challenges and by building interactive projects and games. This teacher resource provides a brief overview for several key concepts in Python as a helpful reference. In EasyCode Pillars, students learn key elements of coding in Python through interactive coding challenges and by building interactive projects and games. 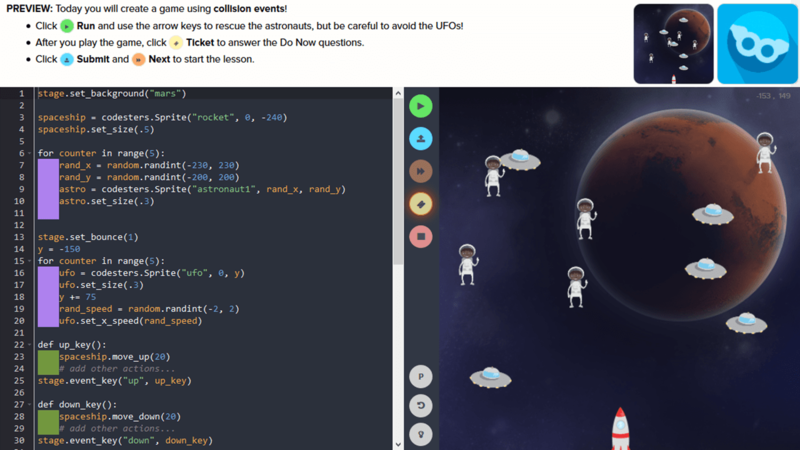 This teacher resource provides helpful tips assisting students in debugging their own code. In EasyCode Pillars, students learn key elements of coding in Python through interactive coding challenges and by building interactive projects and games. This resource provides a helpful checklist students can use to find and fix bugs in their code. In EasyCode Pillars, students learn key elements of coding in Python through interactive coding challenges and by building interactive projects and games. This project planning template can be used to help students plan and create their own projects. In EasyCode Pillars, students learn key elements of coding in Python through interactive coding challenges and by building interactive projects and games. This teacher resource is a quick reference guide to frequently used hotkeys. In EasyCode Pillars, students learn key elements of coding in Python through interactive coding challenges and by building interactive projects and games. This teacher resource provides instructions for how to create your own sprites and backgrounds.